My cat started having coughing spells. I thought she was trying to cough up a hairball. My veterinarian has diagnosed feline asthma and bronchitis. What is this condition? The term feline bronchitis describes the coughing and/or wheezing that comes from inflammation in the lower airway. Asthma and bronchitis are typically considered as two parts of the same syndrome. This syndrome may also be referred to as chronic obstructive pulmonary disease (COPD). If the cat's airways are sensitive to certain stimuli, exposure to those agents can cause an inflammatory response and the cat will experience bronchial spasms, increased mucus production, and possible accumulation of mucus in the airways. Inability to clear the bronchi of mucus can lead to airway obstruction and may leave the cat susceptible to secondary respiratory infections. Chronic airway obstruction may trap air in the tiny lung passages called alveoli, leading to over-inflation and lung damage. "Coughing is a significant finding since there are relatively few causes of coughing in cats." Coughing and respiratory distress including difficulty breathing, shortness of breath, and open-mouth breathing are the most common signs of feline asthma and bronchitis. Coughing is a significant finding since there are relatively few causes of coughing in cats. Coughing cats assume a squatting position with the neck extended. These cats will also generally wheeze - sometimes loud enough to hear if you are close to the cat. Are some cats more likely to get asthma? Asthma and bronchitis are seen most commonly in cats from two to eight years of age, and Siamese cats seem to be at higher risk for developing this disease syndrome. Overweight and obese cats are also at greater risk for developing chronic respiratory disease. Dental disease increases the risk that bacteria will travel from the mouth into the lungs and cause a serious secondary infection. 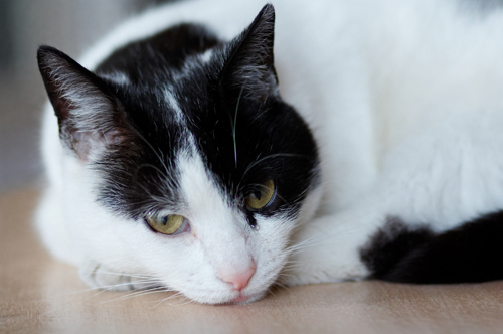 What causes feline asthma and bronchitis? What are the signs of asthma and bronchitis? In its early stages, the main sign is chronic coughing, or coughing that persists for longer than a month. The cough is usually 'dry' or harsh, and gagging is common after coughing. It can appear similar to coughing up a hairball. As the disease progresses, the cat may appear to have less energy and may have difficulty breathing. Breathing may become noisy, and the pet may wheeze when exhaling. In later stages, the gums may develop a bluish tinge as a result of lack of oxygen. Cats with asthma or chronic bronchitis rarely have a fever and usually their appetite remains normal. Diagnosing asthma and bronchitis in cats requires ruling out other diseases that cause respiratory signs. These diseases include infectious pneumonia (fungal, bacterial, parasitic), feline heartworm disease (cats are hosts for the canine heartworm disease parasite), primary lung parasites, and cancer (either a lung tumor, or one that has metastasized, or spread, to the lungs from elsewhere in the body). "Diagnosing asthma and bronchitis in cats requires ruling out other diseases that cause respiratory signs." Heartworm test. This is a blood test and should be performed on any coughing cat. This is often performed in conjunction with feline leukemia (FeLV) and feline immunodeficiency virus (FIV) tests. These tests are helpful in determining the overall health of the cat. Thoracic radiography (chest X-ray). There are several characteristic changes seen on lung radiographs in cats with asthma and bronchitis. Radiographs can help eliminate other lung and heart diseases. For instance, feline heartworm disease and lungworm create specific suggestive lesions that can be seen on radiographs. Bronchoscopy with cytology and/or culture. Bronchoscopy is a procedure typically performed by a specialist and allows the veterinarian to visualize the airways of an anesthetized cat with a small fiber optic scope. Samples of the mucus and cells lining the bronchi may be obtained for examination under the microscope and for culture. Tracheal lavage. The pet is usually placed under sedation or anesthesia, and a thin, flexible, sterile catheter is passed into the area being investigated. A small amount of sterile fluid is flushed forcefully into the area and then promptly suctioned or aspirated back out. The recovered fluid contains mucus and a small number of cells that can be cultured for microorganisms and examined under the microscope. In most cases, a single underlying cause cannot be identified, despite a complete and thorough diagnostic work-up. Even when the underlying cause is not identified, many cats can achieve a reasonable quality of life with medical management. Avoiding triggers. Any triggers that aggravate breathing problems in cats with this diagnosis should be avoided. This means trying different brands of cat litter, eliminating cigarette smoke from the home, minimizing any dust build up and using air filters/purifiers etc. It is important to pay close attention to environmental factors that may aggravate or worsen the condition. Normalize body condition. Being overweight or obese causes systemic inflammation that can contribute to feline asthma and bronchitis, as well as increasing the workload on the heart and lungs. Normalizing body condition is critical to success. Bronchodilators. Bronchodilators are used to open up the airways, allowing the cat to move air in and out of the lungs more freely. They are usually administered in an inhaled form, such as albuterol/salbutamol brand name Ventolin®). In order for this to be effective, they need to be used consistently, as directed by your veterinarian. Corticosteroids. Corticosteroids have potent anti-inflammatory effects and can provide relief to cats experiencing the respiratory distress of asthma and bronchitis. A cat may receive an injection of long-acting corticosteroid (such as Depo-Medrol®) that has the ability to relieve symptoms for several weeks to several months. More commonly, a cat may be prescribed a short course of oral corticosteroids (prednisolone) combined with an inhaled corticosteroid such as fluticasone (brand name Flovent®) to try to limit the effects of the steroid to the lungs and minimize negative side effects. There is also a combination bronchodilator-corticosteroid combination combining fluticasone and the bronchodilator salmetrol (brand name Advair®) in the same inhaler. Hypoallergenic nutrient profile. Your veterinarian can assist you in understanding if your cat's asthma control will benefit from a food that is either less allergenic, or truly hypoallergenic. Nutrition takes time to have its effect on cats with asthma and bronchitis, but may lower the reliance on medication. Medical acupuncture. Neuro-modulation via medical acupuncture may be a technique that can provide some relief to cats with asthma and bronchitis. In those cats who respond to medical acupuncture, their need for medication to control their symptoms may be reduced. See handout "Treatment Instructions for Asthma and Bronchitis in Cats" for more information on treatment. Will my cat be cured of asthma and bronchitis? Treatment of this disease syndrome is best considered management as a cure rarely occurs. Cats with feline asthma and bronchitis are rarely cured. The goal of treatment is to lessen the severity and frequency of the attacks and improve overall quality of life. Most cats with feline asthma and bronchitis can live very full and active lives. © 2019 Harmony Veterinary Center.